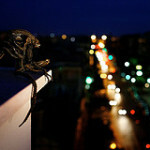 213/365 – “Alien(ation)” nr.1, a photo by Luca Rossini on Flickr. First day of “Alien(ation)”, the eighth theme of the “365 Days of RX1: one camera, one lens, twelve projects” blog. Technically this theme stays somewhere between “Doll’s House”, for the use of toys who seem to be performing an action, and “I’m Batman”, for the inclusion of a well known fiction character into every-day situations. 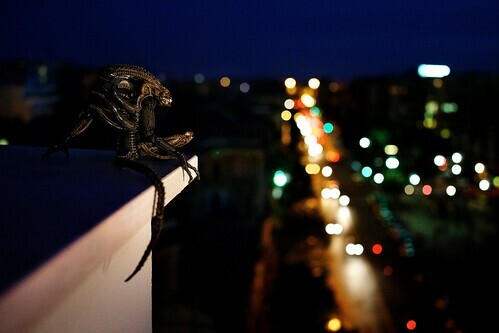 How would the world which surrounds me look to a simpler, purer, and predatory entity such as Alien (even if a small version of it?). Would it be plain wrong or more real than how it looks to our eyes? And how different would it be from the world in which every day live the many alienated people who happen to live in our cities?